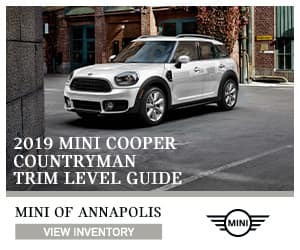 If you’re wanting a reliable subcompact SUV for your travels around Annapolis, Highland Beach, and Hillsmere Shores, the 2019 MINI Cooper S E ALL4 Countryman may be right for you. After all, it has the efficiency you need for any trip, no matter its length. We’ll tell you about it, along with the impressive list of features, in this 2019 MINI Cooper S E ALL4 Countryman review. Continue reading to discover everything this vehicle has to offer and contact us at MINI of Annapolis if you have any questions. 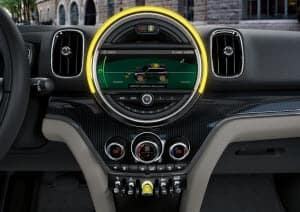 The 2019 MINI Cooper S E ALL4 is the plug-in hybrid version of the Countryman. It comes with a 1.5L TwinPower Turbo 3-cylinder engine with direct injection, along with an eDrive electric motor and hybrid ALL4 system. Together, they deliver 221 horsepower and 284 lb-ft of torque (134 horsepower from the engine and 87 horsepower from the electric motor). Since the hybrid runs on gasoline, electric power, or both, you get a flexible range of power options. Plus, you can use almost any standard outlet to charge the lithium-ion battery for your convenience. Electric Mode: Lets you cover short distances with zero emissions since it uses power from the battery. This mode is ideal for city driving. Hybrid Mode: Great to use when traveling outside of the city. It uses the engine and electric motor together to offer a total driving range of up to an EPA-estimated 270 miles. Save Battery Mode: This mode is ideal for longer trips. Power generated from the engine is used to partially recharge the battery, keeping it at a 90% charge. Then, when you get closer to your destination, you can switch back to Electric Mode, if desired. Plus, with an EPA-estimated 65 MPGe, 12-mile electric driving range, and the aforementioned 270-mile overall driving range, the Countryman is great for all trips, short and long. Not only does the S E ALL4 Countryman perform well, but it also has a long list of features. It has lots of interior space for people and their belongings. There’s 17.2 cubic feet of trunk space that expands to 47.4 cubic feet when the back row is folded down. Plus, an optional hands-free tailgate makes it easy to access the cargo, even if you’re holding a lot of items. Once inside, you can stay connected and entertained with the standard MINI Connected infotainment system. A 6.5-inch high-resolution screen displays all your media options, and Bluetooth® makes it easy to stream audio or make phone calls hands-free. Furthermore, Apple CarPlay™ is available, so you can connect your smartphone to the vehicle. Plug the phone into the car’s USB port, and your favorite apps will appear on the display screen. You can then listen to podcasts, send text messages, and more, without having to mess with your phone while driving. With a long driving range and plenty of amenities, the 2019 MINI Cooper S E ALL4 Countryman is great for cruising around town. If you want to experience this plug-in hybrid SUV near Annapolis, Highland Beach, or Hillsmere Shores, don’t wait. Schedule a test drive at MINI of Annapolis today!